My husband, Richard, and I occasionally visit his relatives in the Binghamton, N.Y., area. I’m fascinated by the way one particular sandwich – the spiedie – has such a strong presence in the city. Restaurants, delis and diners have created thriving businesses off of these marinated, grilled meat sandwiches, bags of bread for spiedies, and spiedie bottled marinades. Everywhere you look, there is some sign promoting a spiedie cook-off, spiedie recipe contest or spiedie festival. Spiedies identify the town of Binghamton much like spicy Buffalo wings identify Buffalo, N.Y. But don’t call them shish-ke-bobs. I made that mistake the first time eating them. Richard’s Aunt Betty brought home pans of marinated and grilled cubed beef, lamb and chicken from Sharkey’s, a restaurant that promotes itself as the birthplace of the sandwich in the Binghamton area.After one bite, I announced, “I love these shish-ke-bobs,” and my faux pax was greeted with down-cast eyes and a stony silence at the table. “These are not shish-ke-bobs,” Aunt Betty finally informed. “They taste better than shish-ke-bobs, they don’t have vegetables on them and we serve them in Italian bread, like a sandwich.” Got it. Wikipedia continues by saying the word “spiedie” comes from the Italian “spiedo” meaning spit or “spiedini,” which refers to cubes or balls of meat cooked on a skewer. The first spiedies were made only from spring lamb, but today spiedies also use chicken, pork or beef to make the sandwich.The bread is critical to a proper spiedie and best eaten, according to Binghamton spiedie connoisseurs, in a soft, white Italian bun. And another thing, if you think grilled peppers or onions would be a great addition to a spiedie, think again. “Don’t put anything else on the spiedie or it will interfere with the flavor of the marinade,” said Aunt Betty. Understood. 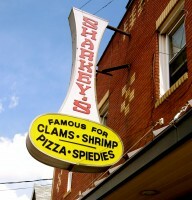 Spiedies are not so much a sandwich as they are a state of mind – a source of citywide pride, defining a region nestled in the Susquehanna River Basin in the fringes of the Catskills.One thing I’ve also discovered is that spiedies are best eaten in their place of origin, which happens to be Binghamton – make that Sharkey’s in Binghamton. No–make that, wherever you happen to be firing up a grill to make the sandwich. This recipe is dedicated to the memory of it’s author, Dena Lampman, a Binghamton native and spiedie connoiseur. Prepare gas or charcoal grill to medium-high heat. String marinated meat on skewers and grill 3-7 minutes per side, depending on heat of your flame, or until cooked to desired doneness. Sprinkle with parsley. 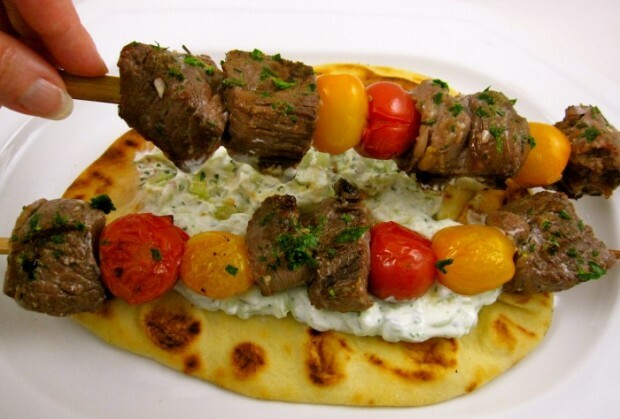 Remove meat from skewers into buns and serve. *Of course you won’t find buns specifically labeled “spiedie buns” outside of the Binghamton, N.Y., area. But they are similar to a lobster roll or soft hoagie bun. Richard and I prefer a freshly baked Italian roll or ciabatta for our spiedies.